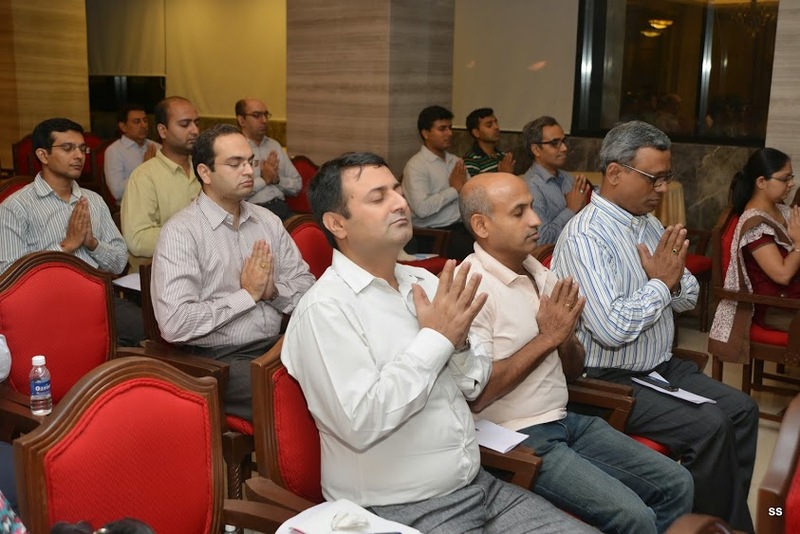 IAIP Mumbai organized a Wellness Workshop entitled “Mudra- The Power is in your hands” on 5th December. The speaker was Deepa Vaswani, a prominent Yoga Mudra consultant. Deepa went on to explain the importance of Mudras in our life, which she pointed out was lost in the ancient time while other forms of Yogas were brought/introduced by our sages, such as Kriya Yogas etc. These chakras when vibrated give benefits related to those chakras. Vaswani then demonstrated the concept of “Embracing Change through Reinvention”. For this she played a video of the Eagle. At the age of 40, the Eagle has grown really old and weak. His beak has become blunt, his talons lose their grip and his feathers are in tatters. Due to this, he is unable to hunt or fly. He faces a grim choice – he must either change or perish. So he flies off to his rocky nest high up in the mountains. There he knocks his beak on the stones, until his old beak falls off, allowing a new one to grow in its place. With the new beak, he tears off his blunt talons, allowing new talons to grow. With the sharp new talons, he rips off his old feathers allowing new sleek feathers to replace them. Thus he becomes rejuvenated and is able to hunt again. Having embraced the pain, he will live for another 30 years in fine fettle! Thus, the Eagle symbolizes the eternal truths that “Pain is weakness leaving the body”, and one must embrace change in order to flourish. Deepa then showed how various mudras are performed and their benefits. The important thing, she pointed out was, these mudras can be performed while being in office it greatly relieves our stress, emotions, negative energies, etc. However, she emphasized that the Mudras must be performed while seated and perfectly still, never while moving around. Also, the breathing patterns must be adhered to rigorously, else it would be detrimental. Pran Mudra – This mudra is to performed with our root our mooladhar chakra and this helps in overcoming nervousness. Hakini Mudra – This mudra is good for memory and this is done with fingers and the breathing should focus on the forehead area. The other mudras that were performed during the session were Bhairavi Mudra, Hansi Mudra, Jalashay Mudra, Kaleshwar Mudra, and Vajra Mudra. All these mudras are helpful in releasing negative energy filling the body with positive energy. This entry was posted in Events, Happy Hours, Mumbai and tagged CFA Institute, Deepa Vaswani, IAIP, Indian Association of Investment Professionals, Ishwar Chidambaram CFA, Jainendra Shandilya CFA, Mudra, Sonia Gandhi CFA, Yoga. Bookmark the permalink.